What a day for Scotland's shooters Day 6 turned out to be, the most successful day of this Commonwealth Games and with plenty of shooting still to come it ramps the excitement levels up. First up at 09.00 (midnight GMT) in the Men's 50m Prone Rifle Qualification was STS's Neil Stirton and Leonard (Lenny) Thomson. Neil was competing at his fourth Commonwealth Games but Lenny it was his first, not that you could tell as both men performed really well in qualification. 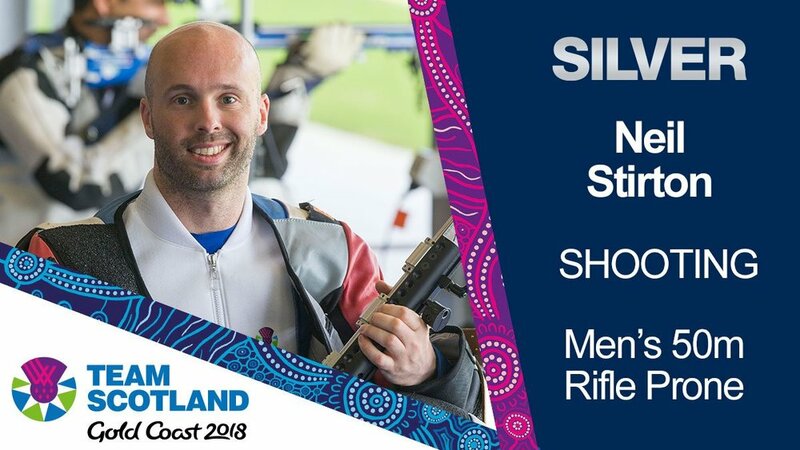 Neil put in a strong performance qualifying in 4th place with a score of 616.9, just 0.1 behind third with shooters from Australia, New Zealand and India all finishing ahead. However, Lenny was not to be outdone and finished just behind Neil finishing with a fantastic 5th place with a score of 614.6 meaning both men qualified for the final. The final took place at 13.00 (04.00 GMT) and the form book from the qualifying went out the window in a competition hotly contested by the Home Nations. It was an amazing final, with Neil leading from the start with a 10.9 and kept the pressure on, staying in 1st place after the first 5 shots with a score of 52.3. Lenny also put in a good first 5 finishing in 7th place with a score of 51.2, 0.1 behind three shooters tied for 4th. 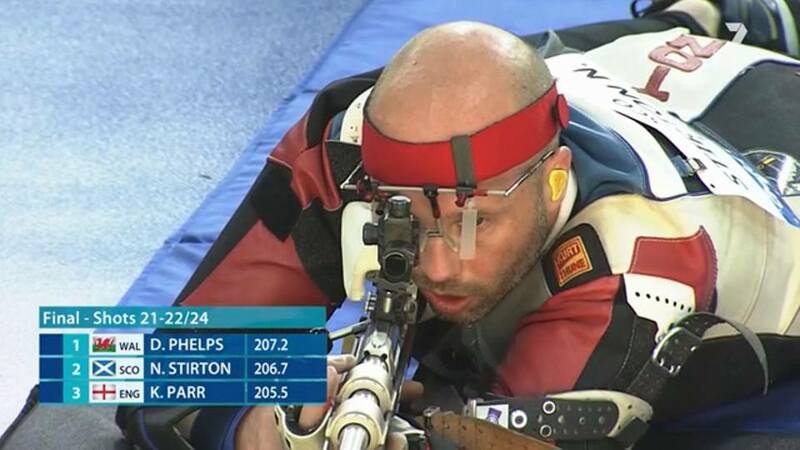 Some top shooting in the next round meant going into the elimination round Neil was still in the top spot with a score of 104.0, 0.1 ahead of David Phelps from Wales. Lenny however didn't quite have the same success as a below par second set meant he was in 8th going into the elimination with a score of 100.3 leaving him a lot to do with a gap of 1.7 behind 7th. In the first elimination Neil dramatically dropped to 6th but the competition was close so he was still only 0.7 behind bronze. Lenny on the other hand put in a great final effort, with a score of 20.9 for his 2 shots but it wasn't quite enough and he was eliminated in the first round finishing in 8th. Neil steadied himself for the second elimination round and pulled it back, moving up to 4th place, only 0.7 off bronze and 0.8 behind a tied gold medal placing. This is when Neil's experience really began to show as an exceptional elimination saw him jump up the table again, tied for the gold medal position with David Phelps with only 4 rounds left. The next elimination saw him drop to silver but stay in contention for gold, 0.1 behind but equally only 0.2 ahead of bronze. Neil held his nerve and in the next round tightened his grasp on a medal, dropping 0.5 behind gold but widening the gap behind him as he led the bronze medal placed Kenneth Parr from England by 1.2. That result guaranteed him a medal. Neil held his nerve again in the penultimate elimination, finishing 0.4 ahead of bronze guaranteeing him a silver medal with a gap of 1.4 to make up to win gold. A great effort in the final elimination closed the gap to 1.1 but what an incredible result by Neil coming away with the SILVER MEDAL! That is Neil's fourth Commonwealth Games medal having also won the silver in the Men's Prone Pair event in Melbourne, gold at the same event in Delhi and a bronze in Delhi in the Men's 3P Pair event but that is Neil's first individual medal. A great result also for Lenny, qualifying for the final in his first ever Commonwealth Games - what a competition for the Scots! However, the excitement of the day wasn't anywhere near over. Next up at 09.00 (midnight GMT) was Jessica Liddon is the Women's 25m Pistol Qualification. Jessica had competed 48 hours earlier in 10m Air Pistol event where she finished 12th and but she was looking to improve on that today in this, traditionally her strong event. The 25m Pistol qualification is competed over two qualifying rounds, precision and rapid fire rounds. First up was the Precision Qualification where Jessica pulled out an incredible display of shooting to end the round in 3rd place on 288-7x, 3 behind 2nd and 5 behind gold. The Rapid Fire Qualification was then at 10.30 (01.30 GMT) and despite some brave shooting, she couldn't quite live up to the high standards set in the earlier qualification round. A score of 274 in the Rapid Fire round meant Jessica finished the overall qualification on 562-11x in 10th place, missing out on qualifying for the finals. However, this was still a fantastic performance by Jessica with a finish that improved on her 10m result. Her ability and contribution to the shooting team means it is easy to forget that this is Jessica's first Commonwealth Games and as with Aedan in the men's pistol events, it shows that Scotland have some talented young shooters to watch out for in the future. By now it was all getting a bit too much for us based back in rainy Scotland to take but there was still the small matter of the Queens Prize Pairs Final at 10.00 (01.00 GMT) to be decided before we could retire to bed (on both sides of the world)! This was entering the second and final day of the pairs competition with Scotland's pairing of Ian Shaw and Alexander (Sandy) Walker starting the day in 4th place but with nothing to split the top 5 teams after an intense day of shooting on Day 1 over 300, 500 and 600 yards. Day 2 was to be contested over the longer distances of 900 then 1000 yards and Ian and Sandy were looking to emulate, if not better, their success at the CSF Championships At Belmont in November 2017 where they came away with the Bronze medal. On Day 1, both of the Scots put in strong performances but it was Sandy who shone, with the 3rd highest score of the day behind David Luckman of England and Ben Emms of Australia but at the start of Day 2 it was Ian who started the best putting in the 3rd highest score at 900 yards. Despite this score, Scotland slipped down to 5th on 441-40v but England, Scotland, Australia and New Zealand were all tied on 441 with 15v separating 3rd and 6th going into 1000 yards. Both Ian and Sandy kept calm under the pressure and this when their training and experience really showed. Sandy put in a great score of 71-6v, the 6th highest of the round and 3rd highest score of the teams in the top 6, while Ian backed it up with a score of 70-3v giving Scotland a combined score of 141-9v for the final round, the second highest score of the round, beaten only by England. 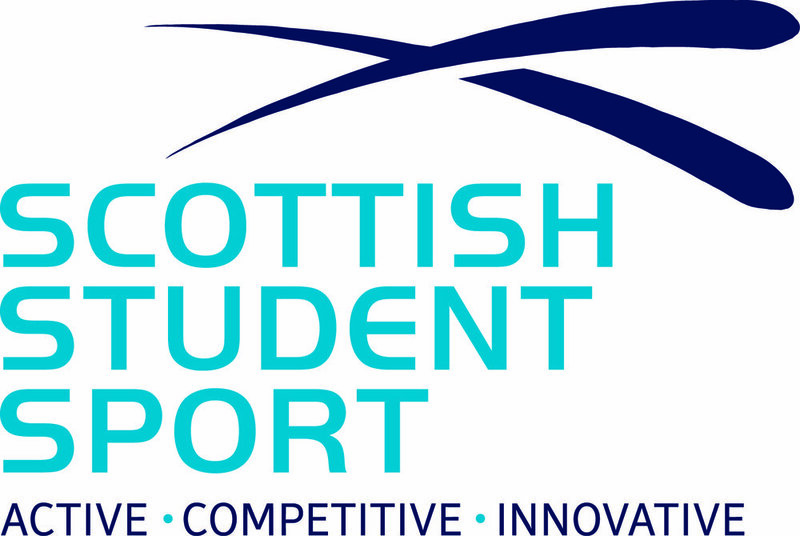 This fantastic final round score was enough to see the Scottish pair jump from 5th to 3rd, only 9v behind second place Wales, to secure the BRONZE MEDAL and repeat their achievement from the CSF Championships! A fantastic result for both Ian, at his 6th Commonwealth Games securing his third medal (winning Bronze in Glasgow 2014 and Silver in Delhi 2010 in the pairs), and Sandy competing at his first Games, especially as it is only in the past 12 months they have been competing as a pair. Both men will now go into the individual event starting tomorrow high on confidence having already secured one medal. First up at 09.00 (midnight GMT) is the Men's Double Trap Qualification where STS's David McMath and Calum Fraser will both be competing in their first Commonwealth Games. Calum is competing after a breakthrough 2017 where he turned domestic form into international success, selected to compete for Great Britain at the European Championships and at the ISSF World Cup. He also won Bronze at the Cyprus Grand Prix. David has also shown extremely good form in 2017, equalling the Scottish record for qualification during the year and beating the Scottish record in a final. He achieved numerous domestic wins and notably a 10th place finish at the World Championships in Moscow so Scotland will have high hopes going into this event. Then at 10.00 (01.00 GMT) Ian Shaw and Sandy Walker are straight back into action on Day 1 of the Queens Prize Individual Finals where they will be looking to repeat the success of their team performance and take away an individual medal. Last but by no means least, at 10.30 (01.30 GMT) Scotland's Linda Pearson will be competing in the Women's Double Trap Finals. Competing in events in Wales and Italy, Linda secured her selection spot with some good scoring and competing in her first Commonwealth Games she will be looking to have a strong showing in the final.